Without humans, driving is rather safe. Tesla has had its share of ups and downs, including a string of car crashes, one of the most tragic being an incident from May 2016 when a Tesla Model S on Autopilot slammed into an 18-wheeler truck and trailer at a highway intersection, which killed driver Joshua Brown. But, the electric vehicle company and its Autopilot autonomous driving system have largely been exonerated in the report released by the National Highway Traffic Safety Administration (NHTSA) which investigated the accident for more than six months. And so, despite the initial crashes, Tesla’s autonomous driving system could actually save lives. 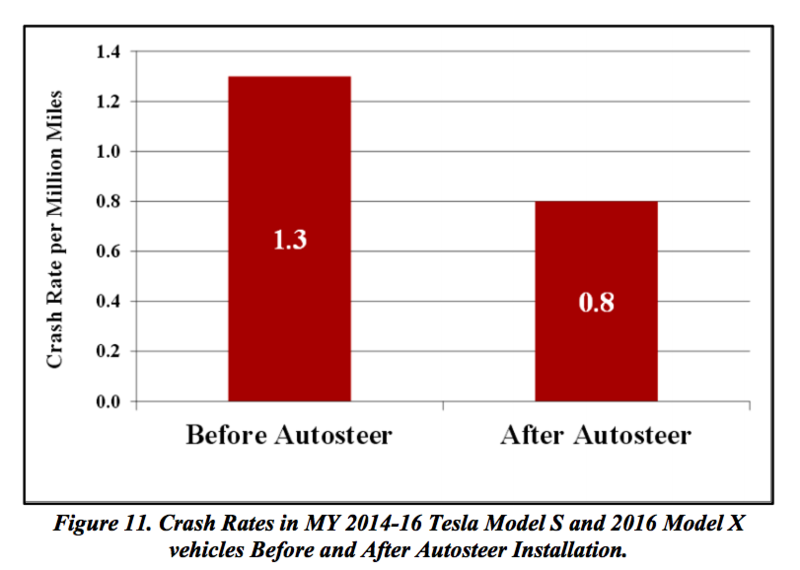 The graph above was generated from NHTSA’s analysis of all mileage and airbag deployment data from Tesla for all 2014 to 2016 Model S and 2016 Model X vehicles that had Autopilot installed. These numbers are bound to improve in the next few months, with Tesla rolling out an even more improved version of Autopilot. This new version includes features —such as traffic aware cruise control, a forward collision warning system, and an autosteer beta version enabled only at “low speed”— all intended to improve the safety of Tesla’s autonomous vehicles. In fact, it’s already saved the life of one Tesla driver when Autopilot predicted a collision two vehicles ahead seconds before it occurred. The autosteer beta is designed to prevent drivers from speeding, as well. This is all leading up to the development of a Level 4 autonomous vehicle. Studies also show that self-driving cars will save more lives in the future —at a rate of 300,000 lives per decade in the case of the United States. Of course, the NHTSA notes that, until we get to that point, driver vigilance is still needed. “While ADAS technologies are continually improving in performance in larger percentages of crash types, a driver should never wait for automatic braking to occur when a collision threat is perceived.” And so, while a future of safe, autonomous vehicles is close, there is still a long road of trial and error ahead.